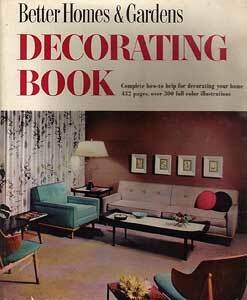 This is the title page from my 1956 edition of the Better Homes and Gardens Decorating Book I’ve shown photos from before (we looked at some ’50s kitchens and living rooms). I love the retro stuff. 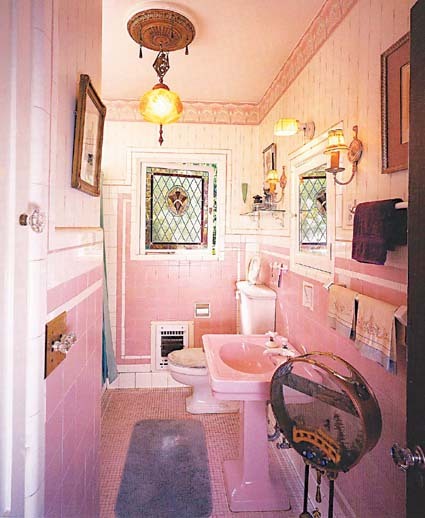 Today we’re taking a gander at the bathrooms, which will explain a lot of things–such as why many of us have lived in houses with pink tile at one point or another. One thing I found interesting was that bathrooms were categorized in a catch-all chapter called “Other Rooms.” This would never happen today, when entire books about bathrooms fill the shelves of the local Barnes & Noble. “Bathroom Color Scheme Stems from Summertime Garden Colors” reads the copy for the picture below. Check out the freestanding towel rack and the built-in planter that runs the length of the window. Fancy! Interesting how they seem to assume your family will be sharing the one bathroom. At the time, they probably did! This bathroom features a pink ceiling and a “practical window treatment,” but–despite the shower curtain– no showerhead that I can see. Where do you suppose that “good mirror lighting” is, exactly? Underneath that little ruffle of fabric? “Venetian blinds in pale pink give light and privacy control, blend with the wallcovering pattern, and are simple to care for,” the book says about the next bathroom. 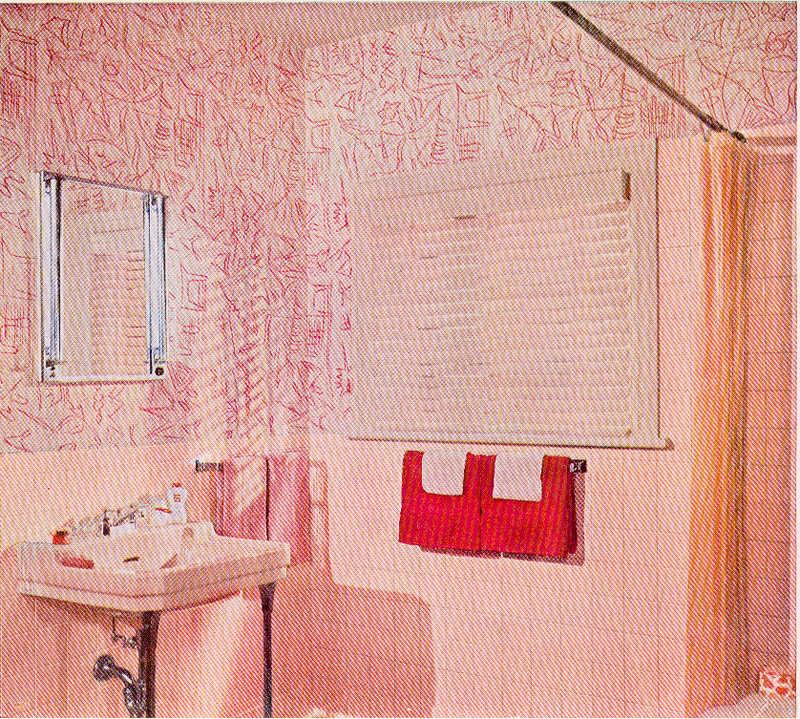 “Colored fixtures and tile set the theme here, with the bright red accent of the wallcovering design repeated in towels and the bath mat.” In the 1950s, pink went with anything! It was treated like a neutral. “How Does Your Bathroom Rate for Beauty and Convenience?” Is it as beautiful and convenient as the one below? This was a pretty progressive bathroom to feature two sinks back in ’56. The cabinets look pretty modern, too. I had a pink-tiled bathroom in the house I grew up in so I’d probably feel right at home in any of these. I even stood on my share of furry, fuzzy bathmats like the one above. How about you? Raise your hand if you had fur-covered toilets, too! P.S. Follow me on Twitter! I’m @hookedonhouses. we totally had fur-covered toilets. ugh. i love when you show us these retro rooms! the bath curtain, in my opinion, is so that the bather can have some privacy – as can the person entering to use the restroom. when there’s only one bathroom in the house, you gotta do what you gotta do. Yikes…sometimes 2 1/2 baths are not enough in our current house! With kids I can’t imagine only having one. (although we did only have one) and it totally had the furry toliet seat covers which my grandpa HATED!! I don’t remember my mother ever having a fur covered toilet. WHEW. She DOES have a very seafoamy Florida shade of green tiles in her 1950’s bathroom. Of which she has matched to her pink painted walls at one time. Yes. Pink and seafoam green. hee hee The walls are now a crisp white, but not too far below the surface lies a pink paint dying to come out. My grandmother lived in a brick ranch house that was built in the 1950’s. Brick houses always look so well-manicured! The house had a very sweet pink bathroom, with pink sink, tub, toilet, and pink tiles around the tub. 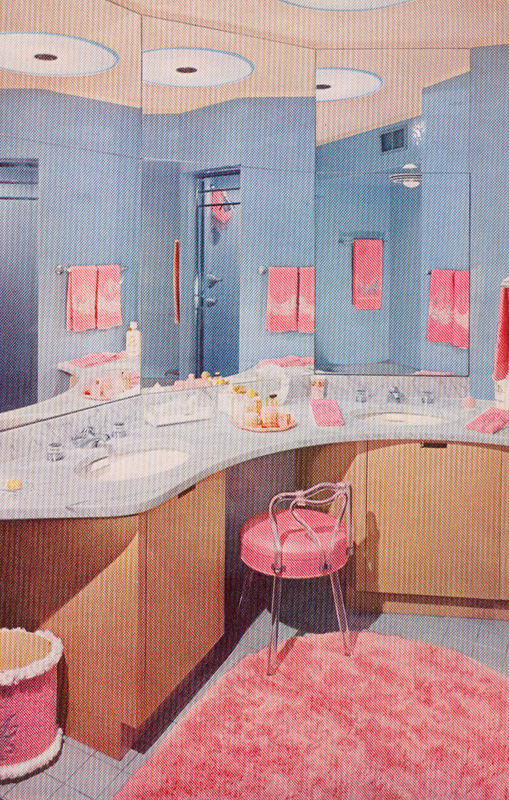 My grandmother kept her bathroom immaculate, so I always have pleasant thoughts about pink bathrooms from the 1950’s. In fact, I almost bought a 1950’s brick ranch house 10 years ago. 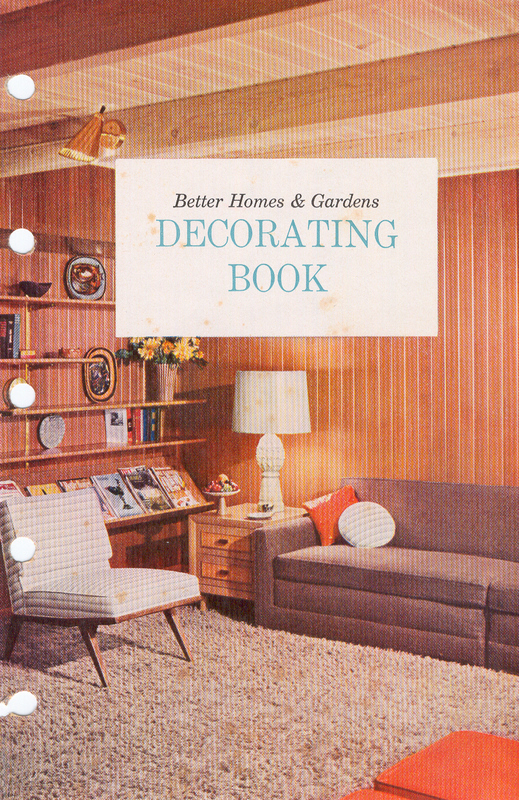 It had been owned by an older couple, and it was straight out of a 1950’s Better Homes magazine, with all the neat built-ins that were so popular back then. It really brought to mind my grandmother’s house. Of course, the lure was the beautiful pink bathroom in pristine condition! I did link to you…I hope that was okay?? I’m very new to this blogging thing but am getting addicted quickly! I love your site and so does everyone else that has seen it from my blog. I laughed out loud (hard) when I went through your “check list”. Good Job! I was so disappointed when the first 1956 house we bought had a beige-tiled bathroom. I had hoped for pink. The currently ’56 house we own has a sage-tiled bathroom. Pink, again, would have been nice! Since I was born in 1956, this one really caught my eye, LOL! Those were fun to look at. 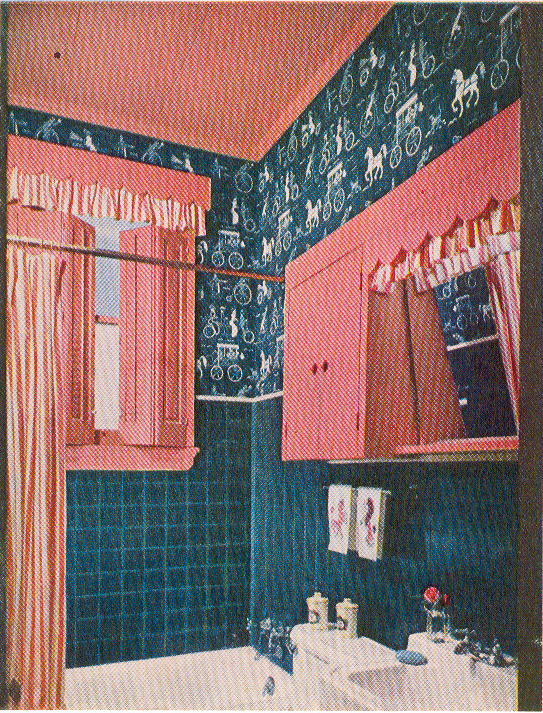 We had pink tile in our 1964 house and that was my mine & my sister’s bathroom growing up. They loved those wild colors back then. Yes, on the fur covered toilets….had that too. Thanks for the fun post, Julia. I’ve never had a pink bathroom, but I enjoyed seeing these. Ah, I was just at our friend’s home yesterday and they have a lovely pink and black tiled vintage bath. I don’t think they appreciate it tho and I dread the day they might rip it out. Ew, I loath pink with RED. Take down that towel, lol! The commentary on this pics from the book are halarious! My grandma’s bathroom is still like this, but blue! I have a few friends with old houses that have pink tile. They hate it, but I love it. Retro is so fun. The house my dad grew up in apparently had pink tile at one time. At some point in the early 70’s they decided to put avacado linolium over the pink tile on the floor. Yikes! My dad bought the house after my grandparents passed away in the mid-90’s and we ripped up the avacado (!) linolium and found the pink tile. My dad had forgotten it was there. I tried to convince him to keep it, but sadly he would not. The original house, when my dad was a kid, was a whopping 900 sqft and the only bath was about 6×7. There were 7 kids plus my grandparents. That’s 9 people in 900 sqft and one bathroom. Can you imagine? Forget the color. Give me a bath that has all those mirrors and space. I Love the one with the place to sit and do your makeup. My dream house has a big master bath. 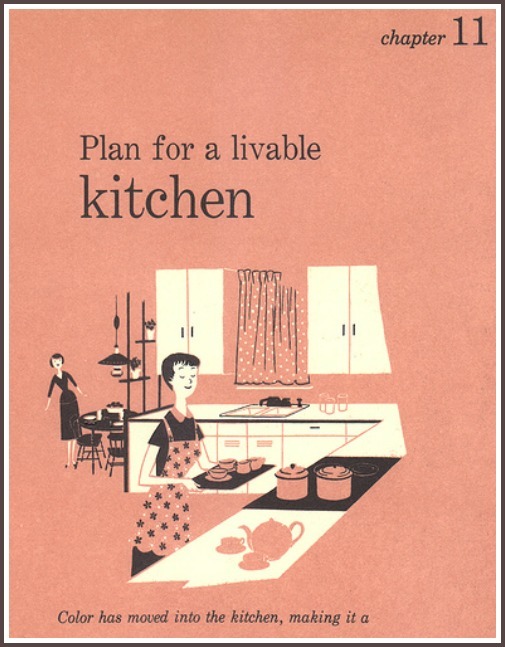 My husband and I bought a ’57 ranch a few years ago with two bathrooms – one floor to ceiling pink and the other green (including toilet, tub, and sink, with the countertop and cabinets made from the same Formica). I would have tried to preserve the tile on the floors or walls, but the inspector recommended that we rip everything down to the studs due to a lot of rust and mold. I’ll have to send you pictures sometime, as it was quite a transformation! When we bought the house, I was so curious as to WHY anyone would want THAT much of one color (I like green, but seriously!). I did a little Googl-ing, and read that so many bathrooms in the ’50s were pink because everyone was inspired by Mamie Eisenhower’s pink dress at her husband’s inauguration. 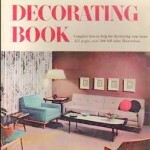 I can’t imagine a First Lady’s wardrobe inspiring my decorating, but they didn’t have HGTV in the 50s! My grandmother STILL has her pink bathtub, toilet, sink and tile vanity! She wouldn’t have it any other way. How manly. Men then must have been very secure in their manhood. 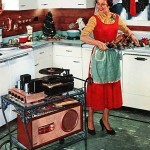 This explains my Grandma’s pink kitchen, complete with pink appliances and pink sink. Or rather, sea foam, I meant. Retro is retro, it’s either hit or miss. Sometime the styles of yesteryear mesh well with modern greatness, other times it makes want to run for the…well, you get the idea. This is the latter. I mean, WOW! is that horrible…but you know what the funny and best part is? 64 years from now, our styles will be looked as puke-worthy. Where, oh where, do I get me some of that teal horse drawn carriage wallpaper?! Awesome post! Saw you on the front page of WP. I appreciated it because my mom’s bathroom still has a lot of these pink highlights. When she moved in, it had a pink tub, sink and toilet. Where in the world can you find a pink toilet?!?! Her house was built in 1954. Yep…certainly was some fur, plus the little rug that fit so neatly around the toilet. Ack! And I had brothers!! Pink power!! Right from the source. Next you could do a lively segment on Harvest gold bath fixtures of the 70’s…YeeeHaw!! Aanyone who reads my blog knows about my spinach vomit/avocado bath now fresh and crisp in white wainscot (which will no doubt be just as dated at some point). Going thru my FIL’s stuff and I came across notes for the building of their 900S.F. ranch, built in 1957. They paid $60. extra for the mint green and black fixtures and tile in the bath!! They also paid $3. extra for the black “iron” hinges on the kitchen cabinets. Most of us “mature” women who grew up in the 50s and particularly in frugal New England never knew anyone who had more than one bathroom. A Powder Room put you right up there with the Rockefellers ( another 50s reference you don’t hear today)! I love that pink and orange together. Looks like a lollipop. My Grandmother’s house had the mid pink and dark pink tiles with mid gray fixtures, and pink angle fish wallpaper. The tile and fixture color combo came from her sisters Packard Caribbean. The master bath was turquoise and gray. The third was yellow with ivy green fixtures for my redheaded mother. It shows that her second husband owned a plumbing supply biz. Sadly the housed was raised for a cross-county freeway in the late 80s. Okay, my parents STILL have a pink-tiled bathroom…and it’s their master bathroom, no less. Let me tell you, I’ve had a few opinions on that bathroom over the years. 🙂 There’s just nothing you can do with pink tile! Btw I’m Baa-aack and have so missed reading your blog. Must go catch up now!! 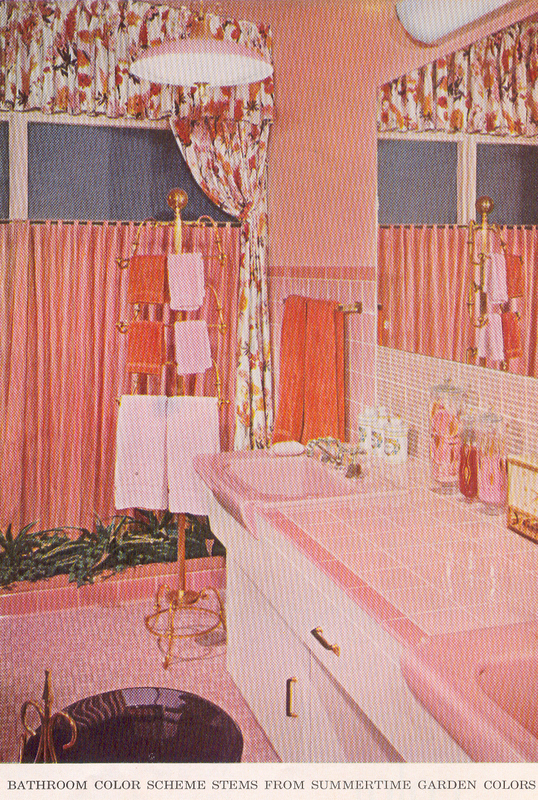 I can tell you why pink bathrooms were so popular in the ’50s! Mamie Eisenhower wore a pink gown to the Inaugural Ball in 1952, setting off an obsession with pink in fabrics, clothing, and, you guessed it, bathroom tile. that the last two are cute in a retro way. I live in a small Massachustts coastal cottage community and found an apt with pink and black tile..owner apologized for not ripping it out! Are you kidding? WOW… please don’t let all that STYLE come back! LOL… WOW… I’m almost speechless! The pink bathroom mania started in the 50’s with Mamie Eisenhower she re-decorated the private quarters in the White House in pink. The color became known as Mamie Pink or First Lady Pink. Whomever thought peptobismol pink bathrooms were the “bomb” was on crack. I swear, if I knew who the designer was of my decorating nightmare, I would put a flaming poo bag on his front porch tonight! What were they thinking!!!! No shower head, but yet a shower curtain. Common in the 50s. The house likely had only one bathroom. The shower curtain provided privacy if someone needed to use the toilet while you were bathing. My folks bought a new ranch-style house in 1957 and chose to have a pink bathroom. It blew me away, even back then! What’s more, my mother did the kitchen in pink and beige, so my Dad spray-painted our little Gibson refrigerator pink to match. It actually was quite adorable and was still running when my father gave it away in 1990. I’ve got an old ’50’s house trailer on my property with all turquoise fixtures, except for the toilet which was replaced with a dark beige model. I’m redecorating it to use as a guest house and would love to find a turquoise toilet to match the rest of the original plumbing fixtures.